Who are free, tribal and militarized societies? Countries evolve and some start off with militarized societies then become free societies of with militarized societies then become tribal societies and so on. Essentially, Western Europe, North America, Australia, New Zealand and Israel are free societies, although Italy can have strong tribal society elements and the city of Paris can have strong militarized elements, and some elements of German society are reminiscent of militarized societies. Eastern Europe and South Asia tend to be tribal societies, along with most of the Middle East and Africa. Saudi Arabia, Sudan and Eritrea have elements reminiscent of militarized societies in them, while Benin, Ethiopia, Guinea, Guinea Bissau and Madagascar were once militarized societies. Most of Latin America and the Caribbean are tribal societies, although Cuba is a notable example of militarized society. East Asia and Southeast Asia tends to have strong elements of militarized societies. The rest of the chat will be notes on doing politics in free, tribal and militarized societies. In free societies: people only choose careers in politics because they have a strong interest in politics. Those who are well-read and master the art of rhetoric and conversation tend to do well and have better careers in politics. For elected positions, the idea is to convince voters to vote for you through promises and by taking action once elected, while for those in bureaucratic positions conversation plays an important role and interaction with citizens is very important. Politicians tend to stay humble and keep a low profile, and politics is not the kind of job you choose for power and money. In some cases politicians have protection, while in others politicians take public transportation like any other citizen would. Politicians are not above the law and have the same rights and obligations as any citizen, and if they violate the law, they have to step down. In tribal societies: people with military backgrounds who fought wars brilliantly tend to be chosen at the higher political positions, or in times of peace people who amassed large fortunes in business take a break from their business careers to enter politics. Politics is an elitist career where you need to know a lot of people in business and in the military. Politicians are above the law and have round the clock protection, and are staffed mostly by people from the military or from the intelligence services; the presidential place is off limits to the average person. In militarized societies: The political machine is an army where you enter through examinations. You start off as an officer (lowest rank) and work your way to “general” positions (highest rank). You are at the mercy of people of higher rank who tell you what to do and you should comply at all times, talking back will get you fired. Civilians don't have access to the political machine, and elite politicians are chosen for their loyalty to the system and obedience to higher ranking officials. Uniforms must be worn at all times; secrets must be well kept, revealing secrets is akin to treason. Politicians don't talk to their friends, family or citizens about their job, and if they do they do so in very vague terms. In free societies: local town halls have debates and discussions, anyone from the town can be elected at the various positions. Pay is symbolic and most elected officials have another day job, are retired or are housewives. Paperwork is important, but so is improving the lives of citizens and carefully managing the budget. Local taxes are mandatory or voluntary, and help set up projects for the town. In tribal societies: local town halls have a leader who is usually a former high-ranking military official or someone who had a decent life in the small local business world. Debates are off limits, there are no talks about improving life in the local town, and the local town hall is mainly the place where you go register your business or get a birth certificate. In some cases you have to give bribes to get a birth certificate or business license. In militarized societies: the local town hall officials are ranked and end up leading if they go through all the consecutive ranks. They deliver birth certificates and business licenses silently but efficiently, but debates or conversation is not their cup of tea. Bribing exists in some cases, while it does not exist in others. Local citizens do send gifts to the local town halls and expect lenient treatment in exchange. Citizens who offend their town hall can have their business license revoked, or their housing permit revoked. In Free societies: Communication with local town halls and districts is almost too frequent and events uniting local town hall and district officials are almost too frequent. Casual conversation among elected officials is important, and while regional offices coordinate, cultural, economic and social activities, doing so is a two-way street where they exchange and debate their views, and in the end, nothing is really imposed to local districts or town halls. If a particular district disagrees with a policy, there is no retribution or revenge taken toward that district or town hall. In tribal societies: the government appoints a crony to the regional district, and the regional district often has leaders who are not from the region or district. A lot of times they are people from the intelligence officers who gather information on the district. There is little or no conversation or events with local town halls, except with the purpose of gathering security-related information. In militarized societies: regional offices are led by people promoted through the ranks in regional or district offices. They are bureaucratic machines who have very specific tasks, mostly gathering statistics and taking action if the statistics do not reflect the region in a positive light. Regional leaders will have great pride and pomp, but will get little or no work done. Offending the regional leader can get you in trouble. If you are a citizen your business or housing will be revoked, if you are an official you will be dismissed or demoted. In free societies: local, regional or national politicians, lawyers, businessmen or citizens who get themselves noticed will be elected or appointed to national political positions. Such appointments are not elitist, and the pay is not stellar. Charismatic leaders with a large network and who know how to influence people tend to be elected or appointed, and their appointments must be consensual. A lot of politicians will stay in national politics for a few years and then retire from politics. National politics is about coordinating regional affairs, along with international treaties and national security. In tribal societies: National politics is something for the big guys, the guys with numbers with many zeros in their bank accounts. They choose, based on consensus, who will be in national politics. In national politics, politicians work for the rights of people with numbers with many zeros in them in their bank accounts. In militarized societies: the leader is someone who worked himself up the ranks of the political machines through absolute loyalty, discipline, courage and deference to the superiors. He or she must have an impeccable attitude and his or her loyalty must pose absolutely no question. National politics is about making sure that statistics and paperwork gets done. Collect statistics, register housing and business, make sure the economy grows, and place your soldiers on the map. If a regional, local official or citizen criticizes national politicians, it is a very serious offense. In free societies: any group of people can form a political party and run for elections. But because political parties must have a presence through all districts and regions, and that costs a lot of money, individuals interested in politics prefer joining well-established political parties. Only those with a lot of money and a good deal of philanthropy can start political parties. You run for elections on a platform and hope to get as many votes as you can. You get votes by using social media, but also by campaigning in local towns, districts and regions. In tribal societies: because the foreign press covers elections, you make sure your elections resemble in some ways those held in free societies. You organize sham campaigns and sham debates. You eventually get elected, and change the election results a little bit. In militarized societies: The press tells you who to vote for. And you do what the press tells you. In some cases there's only one ballot, in other cases there are several ballots but your local newspaper told you exactly who to vote for and why, and that's the ballot you will insert. Sometimes the election will be a sham close-call, to give the illusion of being a free society election. In free societies: legislating is one of the most important aspects of politics and the main thing on politicians' job description. The executive branch issues executive orders that must form a consensus, and if they don't, they are cancelled or changed. The legislative branch issues laws that can be changed or cancelled if they form no consensus. The justice system can establish judicial precedents in the form of legal interpretation that can change or be cancelled if they don't form a consensus. In tribal societies: no one knows exactly what the law is and laws exist in name only. The legal profession is not attractive, and politicians don't really legislate. In militarized societies: laws mainly revolve around the military apparatus. Who gets promoted? Who gets demoted? Who gets fired? In free societies: the military and intelligence services are branches independent of politics who deal little with politicians, and the separation between the army and politics is clear. The military works with politicians on security issues in well-defined manner. The army has a clear mission, so do intelligence services, and there is little room for improvisation. But the army and intelligence services work on more or less egalitarian and consensual manner, rank is not the most important factor in decision-making. In tribal societies: the military and politicians work together in both business and security affairs. They do business together while deciding security-related issues. In some cases bad business deals can affect security, in other cases good business deals can make the military blind to imminent security threats. In militarized societies: political life and military life is ranked in clear fashion and there is an interlocking chain of command where military officials can give orders to civilian politicians and in some cases civilian politicians can boss around military officials. The higher ranking people decide alone, so if it's a bad decision, it has to be implemented nonetheless. Military officers and politicians can have nervous breakdowns and fire an entire platoon or division, and the entire division loses their job or rank. Intelligence officers mainly gather statistics and analyze them, and gather little information on human beings or human interactions that don't come in statistical form. Written reports tend to be shunned; only numbers count. In free societies: labor rights are clearly defined and set to protect workers from abuse and discrimination, but other than that anyone qualified and fit can work for the organization. Imports and exports tend to be a free game, individual companies decide whether they want to import or export or not. In tribal societies: informal labor unions set up rigid standards for who can and can't work for an organization, and job security tends to be of vital importance. Rigid standards are set for imports and exports, set up to protect the oligarchy from competing with others. In militarized societies: labor is a military organization where people must pass tests to work and must work hard and behave well to go up the ranks. Abuse and discrimination is not a crime, and abuse in the form of food and drink deprivation, sleep deprivation, denying medical care, emotional abuse, physical abuse, sexual abuse are common and not considered criminal. Exports are strongly encouraged and a matter of national pride, imports strongly discouraged and a source of national shame. In free societies: housing is something for the private sector to decide and individuals are free to choose where they live. Transportation is the fruit of a public/private partnership, and in some cases the private sector owns the transportation sector, otherwise transportation is for profit. In tribal societies: the government decides where you live. Transportation is owned by the government and is inefficient, efficient private transportation tends to be something of the black market. In militarized societies: you live in housing units that reflect your rank. If you're a factory worker you live with other factory workers. If you're a CEO you live with other CEOs. Transportation is also segregated by rank: all the bus lines and subways lines go to the rich people and rich organizations. If you misbehave or are demoted, you lose the housing and transportation line. In free societies: the private sector controls energy, water and electricity management and runs for a profit. Supply meets demand and people pay for what they use. So they are naturally careful not to overuse energy, water and electricity. In tribal societies: the government gives free or subsidized water, energy and electricity meaning that shortages are frequent. People also overuse water and electricity, because their overuse is not reflected in their bills. People rarely pay their bills, and still get water and electricity. In militarized societies: energy, water and electricity is subsidized, higher-ranking people get it for free in some cases. Statistics play an important role, but the government prefers an oversupply, in some cases people with no rank will be denied water and electricity so people of higher rank can meet their supply. In free societies: each school decides what to teach and each teacher is free to decide what to teach and how to teach it, save a few vague guidelines. Teachers are expected to be well-read and experts at their subject, and the more experience they have, the better they become at teaching. Students only study what they find interesting and what will help them in their future careers. If they want to be businessmen, they will not take the course in astronomy. Few courses are mandatory, and students are encouraged to express themselves and do a lot of talking. In tribal societies: the government decides what teachers teach and teachers tend to be women who are too busy raising families to engage in professional development. Students don't choose what they study, they must study everything. Universities also impose courses, and the government tells students what to study. In militarized societies: schools are ranked and the most disciplined students go to the best schools. Testing is heavy and involves days and days of memorizing facts to get good grades. Memorization is a good sign of discipline. Subjects studied are not important, only the ability to memorize facts is. Teachers read books in the classroom, give students the notes, and tell the students to memorize those notes. Anyone who flawlessly memorizes the notes is almost guaranteed success in life. In free societies: hospitals tend to be private and for-profit. Health insurance tends to be the fruit of a public/private partnership. Healthcare tends to be expensive, but you get good treatment in exchange, don't have to wait in line, hospitals are clean, doctors are competent. The more money you have, the better your healthcare facilities. In tribal societies: hospitals tend to be public and non-for profit. Doctors can be competent or incompetent, but you get what you pay for. Hospitals are not clean, doctors lack equipment, and you have to wait in line for your operation or to fix a broken bone. Emergency rooms are something of a war zone, more reminiscent of MASH than of ER. In militarized societies: hospitals tend to be private and are run like a military organization. Doctors are ranked from top to bottom, start at the bottom and work their way up the ranks. This means doctors can be eager to treat as many patients as they can to go up the ranks while making money for the hospital, and the quality of their care can be dismal in exchange. Private clinics, either legal or illegal, tend to have much better doctors. They tend to be doctors who got demoted from the hospital system, specifically because those doctors care about patients and have a dose of humanism. Plus private clinics tend to be very affordable. In free societies: agriculture, industry and commerce is something for the private sector with no clear central planning. The government can promote local industry or agriculture, but it is something for the private sector. In commerce, private enterprises decide what they want to buy and sell. In tribal societies: agricultural, industrial and commercial activities are planned and centralized. Farmers get lots of subsidies, to the point they feel no obligation to be productive. Industry gets so many subsidies it feels no need to be productive. Commerce is heavily regulated, often by an import oligarchy who wants to kill local agriculture, industry and commerce. In militarized societies: agriculture, industry and commerce is ranked and farmers, industrial workers and commercial workers have ranks among themselves. Only statistics matter, if the numbers look good on paper that's what's important. Farmers, industrial workers and commercial workers do what their supervisors tell them to do, and if they are disobedient or talk back, they lose their farm or business. In free societies: there's a belief that everyone in the world has rights and obligations, should know their rights, should be protected from abusers and should not abuse other people. In tribal societies: human rights is a buzzword that can be used to blame or shame other nations. For example: my buddies, Burundi, have an excellent human rights record, because they are my buddies. Israel, who are not my buddies, have a terrible human rights record and should be shamed for that. Israelis are not my buddies because they are Jewish, and I think the Jewish religion is a bad, greedy and evil religion. In militarized societies: human rights are rarely discussed. When they are discussed, it is in the context of cultural relativism. Human rights means different things to different people, and it means different things to us. Free societies: communications, logistics and postal services are owned by the private sector and run for profit, or by the public sector, or by oligopolies, but tend to run for profit. They also try to be efficient and satirist customers. Tribal societies: the government owns communications, logistics and postal services and you have to be lucky. In some countries the service is outsourced to a foreign company who operates for a profit, is thus efficient. In other cases it is operated by the government, and don't send your mail, don't try to get a phone line and don't try to send merchandise, unless you rely on the black market. Militarized organizations: communications, logistics and postal services are militarized, operate at a loss, but efficiency is the key word. They are very efficient. Free societies: culture, sports, tourism and the media are owned by private companies and will show whatever the public enjoys. They are made to be consumed and enjoyed, not necessarily to be the pride of the nation. In some cases the media and culture can be critical of the nation, as long as people enjoy reading them or watching them. Tribal societies: culture, sports, tourism and the media are a reflection of the tribe. They must reflect the tribe in a positive light, even if in some cases it can border fantasy. Tourism is not always authentic, and mostly deals with appreciating the local tribal lifestyle. Militarized societies: culture, sports, tourism and the media are the pride of the nation and must portray the nation and the military in a very positive light. If foreigners appreciate local culture, sports, tourism and the media it's always a very good thing and we need to win lots of Nobel Prizes and world cups to go up world rankings. Free societies: diplomacy and international relations are about having friendly relations with the rest of the world and helping foreign countries when they are in need. Relations with all foreign nations must be cordial, but we must also improve the standards of living of foreign countries. Tribal societies: international relations is a reflection of the tribe and we must be treated positively as a tribe. If a foreign nation suggests help, that means we failed as a tribe. If we have debts to foreign nations, that means we failed as a tribe. If we are in trouble, we must blame other foreign nations and tribes for our troubles, and portray other foreign nations in a negative light. Free societies are colonizers and too engrained in consumerism. Militarized societies: international relations is the ranking of world nations. We want to be top-ranked nations so we can boss around bottom-ranked nations. As top nations, we tell bottom nations what they should do. Free societies: every member of the delegation is an equal and we try to find a consensus among the delegation on how to negotiate. We then present our position in clear terms and try to find a consensus with negotiation partners. Tribal societies: we must look good during negotiations. We must use carefully crafted poetic language, express ourselves like Shakespeare, and use lots of complicated words. Then we forget why we were in the negotiation in the first place. Militarized societies: foreign governments should never tell us what to do. We are either equals or superior in rank, we either tell them what to do or they ask us “in a cute way” to get things done like a cute wife would ask her husband. The: we'll consider, and maybe we'll say yes. Free societies: We try to avoid misunderstandings and make it clear that we won't favor one business over the other. We are just exchanging information, and we will use a fair process to determine what business gets in and which one doesn't. Tribal societies: politics is a kind of business after all, and government to business is kind of like business to business. We are two business partners trying to reach a deal. 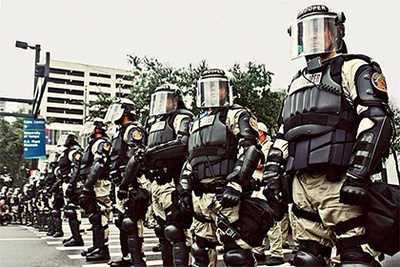 Militarized societies: government ranks higher than business and tells business what to do. Business must comply and must never tell us what to do. If we give business an order, business doesn't talk back. Free societies: If NGOs want to help us fine. Maybe we'll send NGOs to foreign countries as well. We are looking for win-win partnerships, and there's no shame in an NGO trying to help us. Tribal societies: If an NGO comes to us, we look really bad. We don't really need NGOs, so we'll try to pretend that they're a business. They should hire lots of people, and be discreet. We don't want the world to know that we are getting assistance. Militarized societies: NGOs are at the bottom of the miliitary hierarchy but can help us in whatever way they want, as long as they accept that they are at the bottom of the hierarchy. Their organizational structure should be miltiarized, and they should do what we tell them to do. Free societies: the United Nations is a place where we solve the world's pressing issues, help those in need, solve urgent conflicts, and mostly, talk and have lots of conversation. Tribal societies: the United Nations is a place we should look good. They can blame other nations, but please don't blame us. Miltiarized societies: the United Nations is a hierarchical organization where top-ranked nations boss bottom-ranked nations around. The Generals are the United States, Russia, France, the United Kingdom and China. Rich nations can boss poor nations around, but never offend the generals. If the general looks weak, you can offend him, maybe one day you'll get to be general.